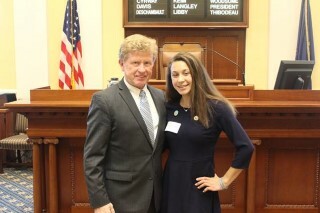 AUGUSTA —Windham Middle School student, Hayleigh Moody, served as an Honorary Page in the Maine Senate on June 5 as the guest of Sen. Bill Diamond, D-Windham. Hayleigh took a picture with Sen. Diamond after the Senate Session. Sen. Diamond extends invitations to honor roll students from the area’s middle and high schools, as a way to recognize their strong academic performance and foster an interest in civics. The Honorary Page Program gives students an opportunity to participate in the Senate and interact with legislators. Honorary Pages see what it is like to work on the floor of the Senate and to be part of a legislative session. Pages perform such duties as delivering messages to senators and distributing amendments and supplements in the chamber. Students from third grade through high school are invited to serve in the Senate Chamber as Honorary Pages when the Senate is in session. For more information or to schedule a visit, call Sen. Diamond at (207) 287-1515.